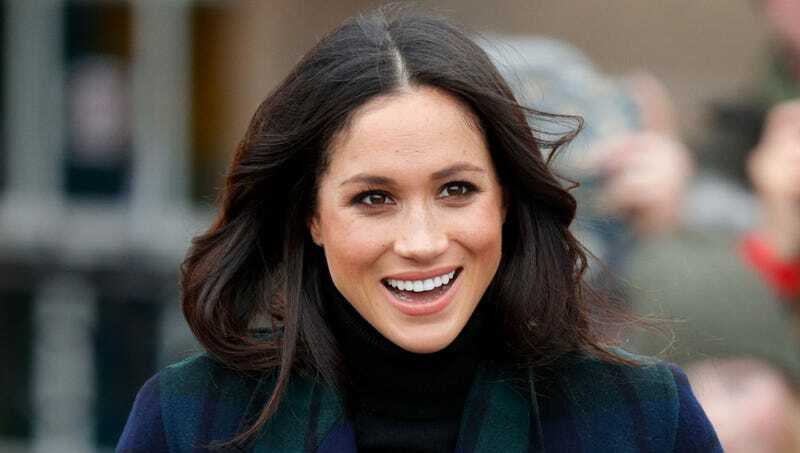 From ‘Deal Or No Deal’ to a leading role on USA’s ‘Suits,’ Meghan Markle has seen a meteoric rise to fame over the past few years. She became a household name in May this year when she and Prince Harry tied the knot at the latest royal wedding. We sat down with Meghan to discuss how she’s adjusting to her new life as the Duchess of Sussex. 1. When you became engaged to Prince Harry, your profile skyrocketed overnight. Has the leap from minor celebrity to royal family member been a fun ride? It definitely has its perks, but the constant harassment from journalists can get seriously annoying. Everywhere I go, there’s a crowd of reporters going, “Meghan! Meghan! Any comment on the rumors of a breakout in the laboratories of the Ethereum Complex?” or “Meghan! Is it moral to even seek a drug that grants immortality at the expense of sanity, let alone testing it on human subjects?” It’s as if they didn’t even listen the last time I said, “Project Atlas will stay the course no matter what, and rumors of a ‘superbeast’ are wildly exaggerated.” How many times do I need to repeat that our carbonium alloy doors cannot be breached before they quit bothering me about it? I guess that’s tabloid culture for you. 2. What’s been the most challenging role you’ve portrayed so far? I held case #24 for a season of Deal Or No Deal, and I went to some pretty dark places trying to get into the headspace of a psychopath who would purposely withhold critical information from honest Americans trying to win money for their families. I had to quit after 34 episodes, not because it was too hard, but because I realized with genuine horror that screwing those poor contestants out of life-changing financial windfalls was actually getting easier. 3. It’s only been a few months since your wedding, but how do you feel it went now that you’ve had some time to reflect? I only appreciate it more as time goes on. It’s truly gratifying to see that someone added subtitles to the video of Harry whispering sweet things to me as we stood at the altar, because I could not hear a single word he said. I personally thought Harry said, “I have an allergy to soup,” which was confusing, upsetting, and really took me out of the moment. 4. What has your relationship been like so far with your new grandmother-in-law, Queen Elizabeth? I think things are always going to be a little tense between women and the matriarchs of their husband’s family at first, and it’s been no different for me—except for the fact that the Queen is, like, 130 years old, so her attempts to be passive aggressive to me have been pretty sad. She’s been doing this thing where she acts all buddy-buddy with Kate Middleton when the three of us are together just to let me know where I stand, but it’s always in the most ancient-person way possible, like asking Kate to help her put a ton of sunscreen on because old people are super afraid of the sun, or asking for only Kate to help her in the bathroom because old people instantly die if they ever accidentally fall off the toilet. She never includes me in her gross old lady stuff as a way to ice me out—which is obviously fine by me. That’s where we’re at now, at least. 5. Do you still keep in touch with your Suits cast members?